I am always looking for captivating topics to monitor using Mantis Pulse Analytics. I definitely keep my political views to myself, so I stayed away from any Presidential Election monitoring and sentiment analysis. I am a sports guy, so I much prefer to track the NFL or NBA – a place where fans can berate each other, and their teams, and still share a drink and commiseration afterwards. 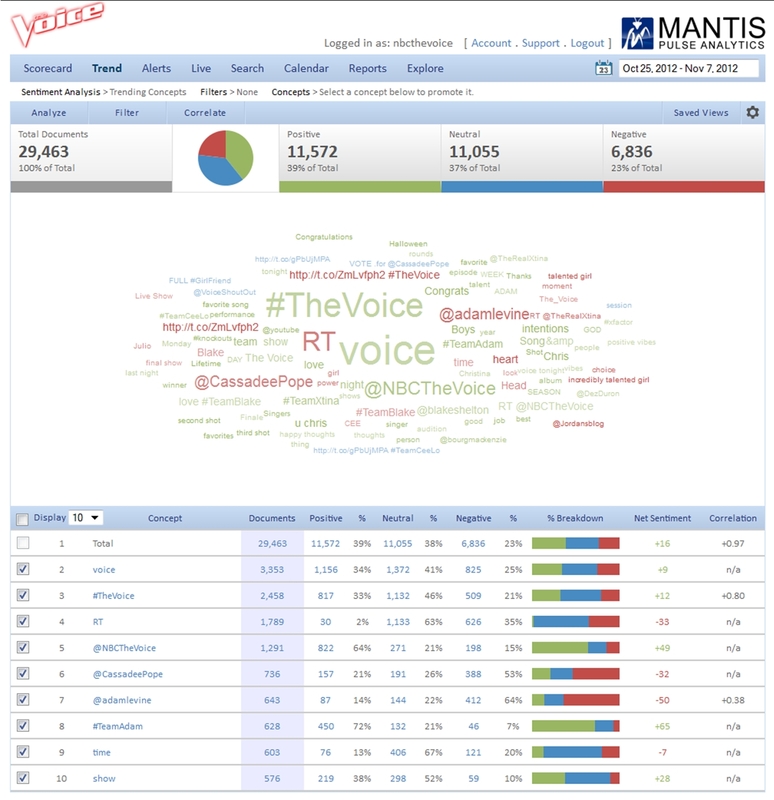 However, not everyone is a sports fan…so I decided to do a little monitoring and sentiment analysis on NBC’s The Voice. I’ve included a few screenshots in this blog post, and you can find more screenshots on the Mantis Pulse Analytics Facebook Fan Page. Let’s start the screenshots with this view of the top “Concepts” around The Voice over this first week that I’ve been collecting data. You can see throughout the data that TeamAdam consistently gets the largest number of votes. I actually have another screenshot where I compare the relative mentions of TeamAdam, TeamBlake, TeamCeeLo and TeamXtina, but you have to check out our fan page to see how that competition progresses! This next screenshot illustrates the results of a Live Feed that ran for about 90 minutes at the end of the show last night. You can see where The Voice is definitely a global brand with vested fans on almost every continent. I did a similar live feed on Monday, and all but Antarctica were represented with about 8,000 mentions in a little over 2 1/2 hours. We can zoom into North America and see which late viewers are doing the most social media interaction around The Voice. Keep in mind that I am only using one search string – “NBCTheVoice” – so the mentions would climb dramatically if I started including mentions of each of the teams. You can also see where Facebook users rarely enter status with “NBCTheVoice” as one word. Instead, I get more Facebook mentions when looking for an individual team or “NBC The Voice”. For my final shot of the day, I zoomed into a metropolitan area. For security’s sake, I’ve blanked out the Twitter ID and avatar. I once took my iPad to a Super Bowl party, and I was able to switch to the satellite view and practically zoom to the specific address. I enjoy some of the gaming features of platforms like Foursquare, but sometimes we release too much location-based information on social platforms. So, did you enjoy this little tour into just some of the features in Mantis Pulse Analytics? 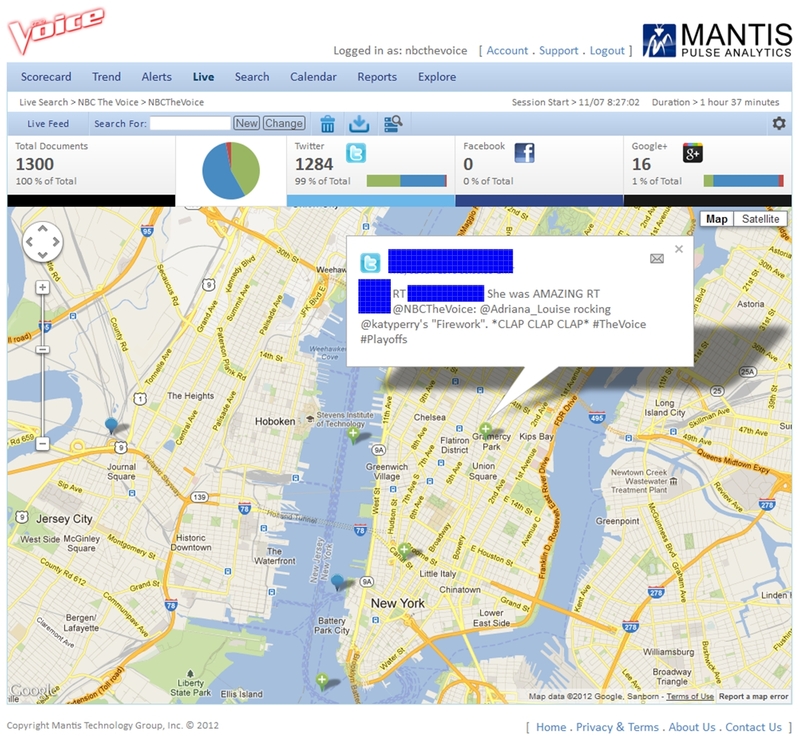 I enjoy giving demonstrations to companies using their own data that is already available on social platforms. It helps them realize that people are already talking about their brands – some good, some bad. Pulse Analytics helps you find those conversations, and then engage people where they are most comfortable. Find and leverage your brand advocates! Find and assist your brand detractors – and turn them into brand advocates by showing them you are a brand that values their input, their customer experience, and their future business. 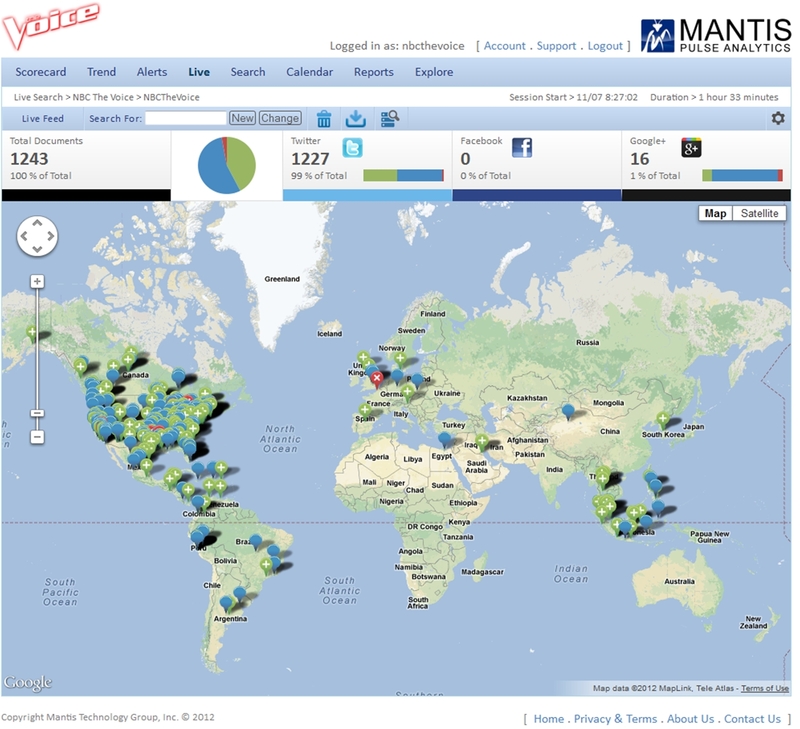 Let me know if you would like a Mantis Pulse Analytics demonstration for your company brand. And if you are a marketing agency, ask us about our agency pricing.